Atika Wines was thrilled to launch our Atika Arts Initiative program for 2017 in January with 2 sold our performances of “Shrouded in Silence”. We are very pleased to be hosting another Atika Arts Initiative event with the Tony Gould Trio on Saturday 2nd December, 3pm at Atika vineyard in Healesville. Details of the trio are below and be assured that the caliber of this trio is second to none. As this will be an intimate home event, concert numbers will be strictly limited. All bookings are through the Atika website so don’t miss out book your tickets today. 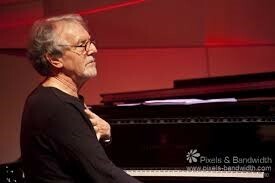 Pianist, composer and educator Tony Gould has received many accolades for his contribution to music in Australia – in 2008 he was awarded an Order of Australia (AM). Tony is much in demand and has performed with many great artists and orchestras both in Australia and overseas. He is probably best known as a great jazz pianist, but is equally comfortable playing classical and other musical genres and enjoys bringing his love of all music to his performances. Tony is happiest when playing with close friends in intimate settings and this musical afternoon at Atika Wines vineyards will provide the perfect setting both for Tony’s trio and the audience. Accompanying Tony are master bassist Ben Robertson and drummer Graham Morris. Atika wines supports junior artists! In the spirit of the Atika Arts Initiative we are delighted to be supporting the most junior developing artists in their artistic journey. The Elsternwick Primary School Art Show encourages their students to express their creativity through their art work. These artworks, together with artwork from the community will be auctioned to raise funds for the school. You can view some of the artwork and more information on the event here. We were thrilled to launch our Atika Arts Initiative program for 2017 with 2 performances of “Shrouded in Silence” last month on the rooftop at Tonic House in Flinders Lane, Melbourne. They were a great success with over 130 people attending. The Atika Arts Initiative is committed to promoting the creative arts and the development of emerging writers, actors, composers and musicians. We have a number of exciting events planned for 2017 so sign up to our newsletter to be the first to find out. A unique opportunity to hear this play reading on the rooftop of Tonic House in Melbourne. Hear this poetic drama that explores the life of a family entangled in a web of consequence, disconnection and inevitability. It reflects on life, relationships and the choices that are made for us. Enjoy the play, a glass of wine, the summer night air and seeing the lights of the city come alive. This will be a truly unique and memorable evening. 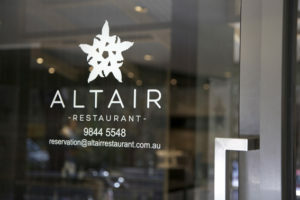 When and where: Thursday 17th November @ Altair Restaurant 6:30pm arrival for 7pm Start $95p.p. 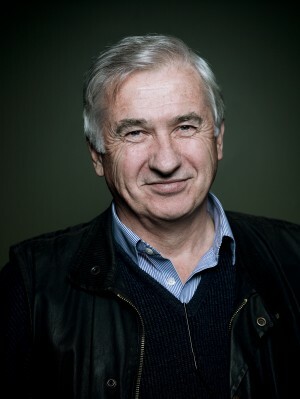 The evening will comprise of a glass of Yarra Valley sparkling on arrival with a two course meal, followed by a reading of Shrouded in Silence by talented artists and starring John Wood. Atika pops-up in Melbourne and Bendigo! Atika is delighted to announce our first pop-up cellar doors for January and February 2014! Our first will take place in conjunction with our Winebank friends in Bendigo. Here are the details. During February we’ll also be staging our first pop-up event in Melbourne! Bring your friends down for some terrific wines and perhaps, a tasting plate or two. Atika Wines win 2 International Wine Awards! The winners of the highly regarded International Wine Challenge in London have been released. We’re thrilled to announce that both the Atika wines submitted (2009 Tempranillo and 2010 Chardonnay) received Bronze medals in the challenge! Also, the Atika Temp was the only non-Spanish grown wine to be placed in its section. Look out Spain! In the coming months, Atika will also sponsor the Personality of Good Food events at Bella Vedere restaurant. The Personality of Good Food is a collaborative project by Damien Pleming and Bella Vedere which is designed to celebrate the people behind all of Bella Vedere’s supplies – people like us! Damien Pleming’s portrait of Atika’s Phillip Taylor (right) will be featured in this exhibition. The vines, as always, continue to soldier on despite our most recent heat wave! It’s all about fast and furious shoot growth in the vineyard during November! If you don’t believe me, just take a look at the beautiful new growth on our Tempranillo vine to your right! 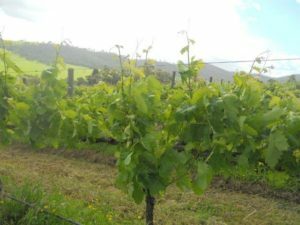 In the past few weeks we’ve been lifting wires to ensure the vines remain stable during this phase of growth, whilst keeping a watchful eye on the weeds – all to ensure the vines are in tip-top shape for the coming phase of Flowering! 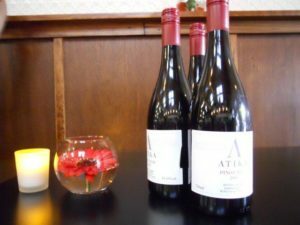 We’d like to extend a huge thank-you to Altair restaurant for the part it played in last month’s phenomenal Atika Wines dinner! Executive Chef, Kelvin Shaw, both surprised and delighted our guests with his incredible creations that perfectly complemented our stable of Atika wines. It was a pleasure to join with such a dynamic and professional team to create such an extraordinary event! 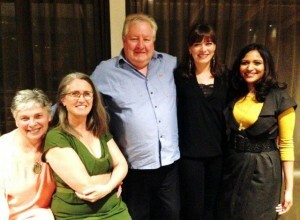 Stay tuned for the Atika Wines podcast coming soon to speakers near you! The last few months have been a wild ferment of activity at Atika HQ! The big news in the vineyard is that the buds have finally burst and the 2014 season is upon us! As you may recall, ‘budburst’ is the all important first stage of the annual growth cycle of the vine. Pretty soon the vineyard will once again be awash with green as a steady sea of new shoots emerge. 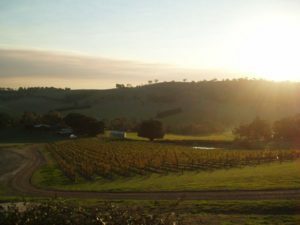 Outside of the vineyard, we have been busily preparing for our coming event with Altair restaurant. For this event Executive Chef, Kelvin Shaw, will match Atika Chardonnay, Pinot Noir and Tempranillo with an exceptional six course meal that is rumoured to include white truffles, oysters and duck foie gras! This will be a dinner for serious foodies and wine drinkers! Limited seats are still available for the Altair event, see details below to book! For those of you that may not know… September is big news in the vineyard! It’s during September that vines grown in the southern hemisphere kick off their annual growth cycle with ‘budburst’. Last month our vines were busy ‘bleeding’ or ‘weeping’ in preparation for budburst to begin. Despite the melancholy name, this process is the heady first sign that our vines are coming back to life after winter!! During August warmer soils awaken a vine’s root system, driving sap into the upper reaches of the vine. 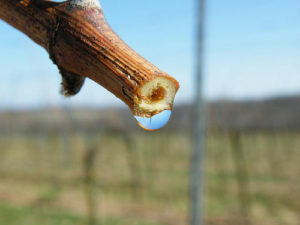 Weeping droplets of water hanging from a vine’s softening cane is the surest sign of the coming revival! Over the next few weeks, green shoots will burst from swelling buds and the 2014 season will have begun! In recent weeks, Atika teamed with Country Chef of the Year, Gary Cooper, to present the ‘Nostalgia’ dinner at Bella Vedere restaurant. This ingenious dinner saw Atika wine paired with Cooper’s comfort food to arouse sentimental or nostalgic feelings in those eating (and drinking!!). Over 5 sentimental courses with Atika Tempranillo and Chardonnay, Cooper tenderly guided us through the flavours of our past. If transcendent food and wine experiences are what you’re looking for, stay tuned for Atika’s coming events! !